This grading period brings the topic of “community” to the foreground in visual arts. For all grades, we have been learning what a community is and how Art plays a role in developing a sense of community. 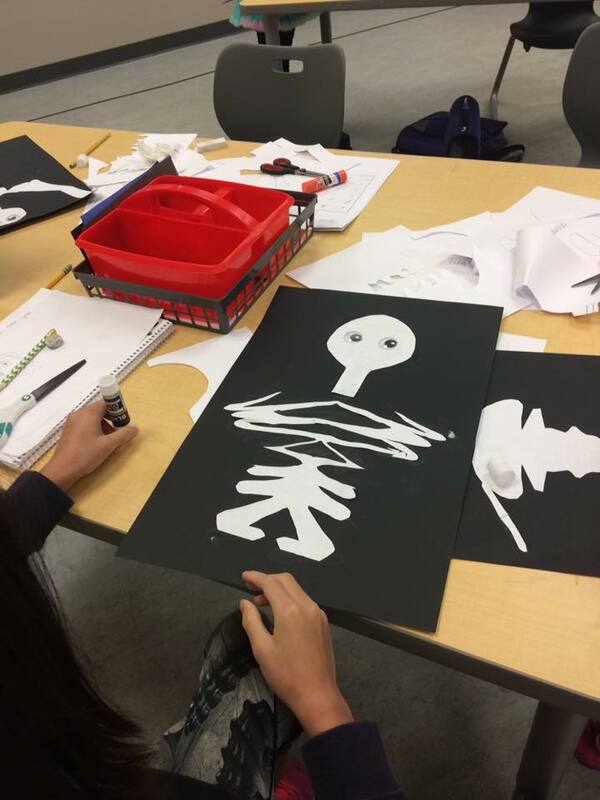 To tie this theme to our own community, some grades have been working on decorations and art pieces for the Halloween Mixer that took place last Friday. In third grade, students were finishing up a Cursive Skeleton project in which they wrote their name in cursive, turned it sideways, and created a skeleton out of it. When they were finished, they had a few other options of projects they could work on: spider webs, bats, or a Halloween-themed chain that could hang on the walls. I watched as a few groups of students started to make their chains in pairs. Without teacher prompting, Sophia R. took her project to the floor and invited a few others to link theirs to hers, telling the others, “if we work together we could make it so long that it would reach the other side of the art room!” The students then invited other students in the class to join in their quest. What started out as individual projects was now a group project. Once they met their goal they celebrated and decided to create an even bigger vision. Xun said, “Let’s see if we can make it around the entire classroom!” By this time everyone was finished and invested in what was happening. There were some students responsible for cutting, others for gluing, and the rest for assembling, all of which was student directed. I’m pretty sure there was even a safety inspector! Among the work, I heard Minna say, “Just because we are small doesn’t mean we can’t do big things. We can do this!” And they did.